Dorothy Emma Arzner (January 3, 1897 – October 1, 1979) was an American film director whose career in Hollywood spanned from the silent era of the 1920s into the early 1940s. From 1927 until her retirement from feature directing in 1943, Arzner was the only female director working in Hollywood. Additionally, she was one of a very few number of women able to establish a successful and long career in Hollywood as a film director until the 1970s. Arzner made a total of twenty films between 1927 and 1943 and launched the careers of a number of Hollywood actresses, including Katharine Hepburn, Rosalind Russell, and Lucille Ball. Additionally, Arzner was the first woman to join the Directors Guild of America and the first woman to direct a sound film. Arzner was born in San Francisco, California, in 1897 to Louis and Jenetter (née Young) Arzner but grew up in Los Angeles, where her father owned a restaurant. Her parents' restaurant was the first place Arzner came into contact with Hollywood elite; it was frequented by many silent film stars and directors, including Mary Pickford, Mack Sennett, and Douglas Fairbanks. After finishing high school she enrolled at the University of Southern California where she spent two years studying medicine with hopes of becoming a doctor. During World War I she joined a local Southern California ambulance unit. After spending a summer working in the office of a respected surgeon however, Arzner decided that she did not want a career in medicine. "I wanted to be like Jesus," she said. "'Heal the sick and raise the dead,' instantly, without surgery, pills, et cetera." After World War I the film industry was in need of workers. According to Arzner herself this was her opportunity to get a foot in the door. "It was possible for even inexperienced people to have an opportunity if they showed signs of ability or knowledge" she said in a 1974 interview published in Cinema. A girl friend from college suggested Arzner meet with William DeMille, a major director for Famous Players-Lasky Corporation, the parent company of Paramount. Arzner told the Sunday Star in 1929 that the friend thought she would be well suited to the industry. "Then she drove me over to the Paramount studio and dumped me out in front of the main office" she said. When Arzner met with DeMille in 1919, he asked her in which department she would like to start. "I might be able to dress sets," Arzner replied. After asking her a question about the furniture in his office that she did not know the answer to, DeMille suggested Arzner explore the different departments for a week and talk to his secretary. Arzner spent the week watching the sets at work, including that of Cecil DeMille, after which she made the observation "If one was going to be in this movie business, one should be a director because he was the one who told everyone else what to do." At the recommendation of DeMille's secretary Arzner decided to start in the script department, typing scripts so she could learn "what the film was to be all about." Within six months Arzner became an editor at the subsidiary of Paramount, Realart Studio, where she edited 52 films. In 1922, she was recalled to Paramount proper to edit the Rudolph Valentino film Blood and Sand (1922). This proved to be Arzner's opportunity to try her hand at directing. Although she went uncredited, Arzner shot some of the bull-fighting scenes for the film and edited this footage, intercutting it with stock footage, thereby saving Paramount thousands of dollars. Arzner's work on Blood and Sand caught the attention of director James Cruze who would later employ her as a writer and editor for a number of his films. According to Arzner, Cruze told people she was "his right arm." She eventually wrote the shooting script and edited Cruze's Old Ironsides (1926). Through her work with Cruze, Arzner gained considerable leverage and threatened to leave Paramount for Columbia if she wasn't given a picture to direct. "I had an offer to write and direct a film for Columbia," Arzner said, "It was then I closed out my salary at Paramount and was about to leave for Columbia." Before leaving, Arzner decided to say goodbye to "someone important and not just leave unnoticed and forgotten" which led her to Walter Wanger, the head of Paramount's New York studio. When she said she was leaving Wanger offered Arzner a job in the scenario department and a discussion about directing sometime in the future. Arzner replied "Not unless I can be on a set in two weeks with an A picture. I'd rather do a picture for a small company and have my own way than a B picture for Paramount." Wanger then offered her a chance to direct a comedy based on the play The Best Dressed Woman in Paris, which would later be titled Fashions for Women (1927), Arzner's first picture. Prior to Fashions for Women, Arzner had not directed a thing. "In fact I hadn't told anyone to do anything before," she said. The film starred Esther Ralston and was a commercial success. Arzner's success led Paramount to hire her as director for three more silent films, Ten Modern Commandments (1927), Get Your Man (1927), and Manhattan Cocktail (1928), after which she was entrusted to direct the studio's first talking picture, The Wild Party (1929) a remake of a silent film which Arzner herself had edited. The Wild Party starred Clara Bow in her first talking picture, and Frederic March, in his first leading role. To compensate for Bow's awkwardness around not being able to move freely due to the cumbersome sound equipment, Arzner had a rig made in which a microphone was attached to the end of a fishing rod allowing Bow to move around thus creating the first boom mic. The film about a college girl, played by Bow, who leads a party lifestyle and falls for one of her professors, March, was a huge commercial and critical success. The Wild Party was such a success that it kicked off a series of films "set on college campuses where the fun-loving, hard-drinking students include coeds who fall in love with their professors." After The Wild Party, Arzner directed eleven more features for Paramount, including Sarah and Son (1930) starring Ruth Chatterton and Honor Among Lovers (1931) starring Claudette Colbert, though after 1932 she left the studio to work on a freelance basis. During her time freelancing, Arzner made some of her best-known films, Christopher Strong (1933) with Katharine Hepburn, Craig's Wife (1936) starring Rosalind Russell, and Dance, Girl, Dance (1940) featuring Lucille Ball. Christopher Strong follows a female aviator named Cynthia Darrington, played by Katharine Hepburn, who begins an affair with a married man, Christopher Strong. Towards the end of the film, Strong's wife Elaine appears to both acknowledge and forgive Cynthia for the affair. This is an example of the way Arzner turned conventional societal views of women upside-down. Instead of pitting the two women against each other, buying into the narrative of women as rivals, Arzner complicates and interrogates typical views of women by portraying a genuine moment of connection between Cynthia and Elaine. In an article for Jumpcut, Jane Gaines argues that a reading of Christopher Strong could allude to Arzner's belief that "heterosexual monogamy cripples the imagination and curbs the appetite for living." Arzner herself noted that the film was well-liked at the time but that she never considered it her favorite. "I could hardly consider any one a favorite," she said. "I always saw too many flaws." Craig's Wife tells the story of Harriet Craig, played by Rosalind Russell, a woman so consumed by the upkeep of her home that nothing else interests her. The film was based on a stage play of the same name by George Kelley but differed in its treatment of its female protagonist. The play, in a much more misogynistic look at the American housewife, sided with Harriet's husband, portraying her as cold and disinterested. Arzner's version turned the story into "a plea for women to become their own people rather than beautiful possessions." In her essay entitled The Woman at the Keyhole: Women's Cinema and Feminist Criticism, Judith Mayne writes that "it is Harriet's husband who married for love, not money" whereas Harriet approached the marriage as "a business contract. "In this way, Craig's Wife is an example of a running theme in Arzner's work: the repressiveness of heterosexual marriage.Mayer writes that Arzner's films "show again and again that when a man believes he can own a woman and women have to compete for men, then romance, loyalty and friendship go out the window." In Craig's Wife, Arzner offers the possibility of women's community after the instability of heterosexual romance with the final scene between Harriet and widowed next door neighbor. Both women have been left by their husbands, in vastly different ways, and their next potentially meaningful connection is with each other. Dance, Girl, Dance is one of Arzner's most celebrated films. Described by Variety as "an unlikely-female-buddy burlesque movie that conceals a withering attack on the male gaze under its showgirl wardrobe of sequins and feathers," the film starred Lucille Ball and Maureen O'Hara as the pair of showgirl best friends. Dance, Girl, Dance is yet another example of the ways in which Arzner subverted and complicated traditional depictions of women and female relationships. The film is Arzner's best-known and most-studied work and thematizes the issues of female performance, female relationships, and social mobility. Most notable though, is the film's interrogation of the male gaze. Dance, Girl, Dance "foregrounds dance as women's avenue to self-expression and economic independence." In a scene towards the latter half of the film, O'Hara's character Judy stops her stage performance to directly address the diegetic male audience. Judy confronts the men with a stirring admonishment of their objectification of women. In feminist film studies, this scene has been read as a "returning" of the male gaze and a larger address to the real life, not just diegetic, audience. In 1943, after making First Comes Courage (1943), Arzner retired from Hollywood. Though it is not known why she did so, it is speculated that Arzner's retirement was due to a decline in critical reception and commercial success of her films. It could also have been due to the increasing of systemic sexism and homophobia after the implementation of the Hayes Code. Despite leaving Hollywood, Arzner continued to work in the field of film. She made Women's Army Corps training films during World War II. In 1950 Arzner became associated to Pasadena Playhouse, a well known theatre company in southern California, where she founded filmmaking classes. She produced some theatre plays and starred a radio program called You wanna be a star. In 1952 she joined the staff of the College of the Arts of the Playhouse as the head of the Cinema and Television Department. She taught the first year of cinema in the university. In the late fifties she became the entertainment and publicity consultant at the Pepsi company, with influence of the boss's wife, Joan Crawford, with whom Arzner had a close relationship. Arzner made a series of successful commercials for Pepsi, most of them with Crawford. In 1961 Arzner joined the UCLA School of Theater, Film and Television, in the Motion Picture division as a staff member, where she spent four years supervising advanced cinema classes before retiring in June 1965. There she taught Francis Ford Coppola. and became an evident reference for him in the future. Arzner's documents, files and films are preserved in Cinema and Television File in UCLA, thanks to Jodie Foster, who raised sufficient funds for their maintenance. Even though she started her medical degree in the University of Southern California, in a 1974 interview with Karin Kay and Gerald Peary published in Cinema, Arzner said "With a few summer months in the office of a fine surgeon and meeting with the sick, I decided that was not what I wanted. I wanted to be like Jesus – 'Heal the sick and raise the dead', instantly, without surgery, pills, et cetera. "[full citation needed] It was then, after two years into her degree, that she left and decided to find a job so she could acquire economic independence. Arzner, in spite of having abandoned the degree, had a broad education, which included architecture and art history courses. As soon as she left the university she began working for Paramount Studios doing jobs such as that of a cutter or editor, for which she would be specifically recognized in Blood and Sand (1922). Later, the studios would offer her a two year contract as a director, but it wouldn't be until the contract was finished that she would start a freelance career. Arzner would maintain a forty year relationship with Marion Morgan, a dancer and choreographer who was ten years older than Arzner. Even though she tried to keep her private life as private as possible, Arzner had been linked romantically with a number of actresses, including Alla Nazimova and Billie Burke. It was rumored, though never confirmed, that Arzner also had relationships with Joan Crawford and Katharine Hepburn. She never hid her sexual orientation, nor her identity; her clothing was unconventional for a woman of that time, she wore suits or straight dresses. Marion Morgan, Arzner's partner, choreographed some dancing sequences in some of Arzner's movies, such as Dance, Girl, Dance. In 1930, Arzner and Morgan moved to Mountain Oak Drive, where they lived until Morgan's death in 1971. While they lived in Hollywood, Arzner assisted various cinematographic events. In her last years Arzner left Hollywood and went to live in the desert. In 1979, at the age of 82, Arzner died in La Quinta, California. Arzner's work, both as a female filmmaker and a queer filmmaker, has been an important area of film studies. Perhaps due to Arzner's leaving Hollywood in the 1940s, her work had been all but forgotten until the 1970s when she was rediscovered by feminist film theorists. Since then Arzner's films have been studied for their depictions of gender and female sexuality. For her achievements in the field of motion pictures, Arzner was awarded a star on the Hollywood Walk of Fame at 1500 Vine Street, the only award she received. In 1972 the First International Festival of Women's Films honored her by screening "The Wild Party", and her oeuvre was given a full retrospective at the Second Festival in 1976. In 1975 the Director's Guild of America honored her with "A Tribute to Dorothy Arzner." During the tribute, a telegram from Katharine Hepburn was read: "Isn't it wonderful that you've had such a great career, when you had no right to have a career at all?" In March 2018, Paramount dedicated its Dressing Room building to Arzner. R.M. Vaughan's 2000 play, Camera, Woman depicts the last day of Arzner's career. In the play, Harry Cohn fires her over a kissing scene between Merle Oberon and fictitious actor Rose Lindstrom—the name of a character played by Isobel Elsom in Arzner's last film, First Comes Courage, in which Oberon starred—in a never-completed final film. The play also depicts Arzner and Oberon as lovers. It is told in a prologue, four acts, and an epilogue in the form of a post-show interview that contains actual quotations from Arzner. S. Louisa Wei's 2014 feature documentary, Golden Gate Girls, compares the media representation of Arzner with that of Esther Eng, Hong Kong's first woman director who was a Chinese American. 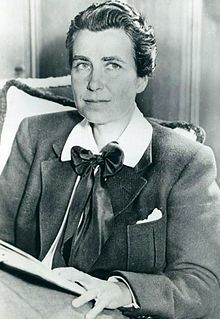 Judith Mayne, the author of Directed by Dorothy Arzner, is interviewed in the documentary, saying, "I love the fact that history of woman filmmakers now would include Dorothy Arzner and Esther Eng as the two of the real exceptions, who proved it was entirely possible to build a successful film career without necessarily being a part of mainstream identity." ^ a b Gaines, Jane (1992). ""Dorothy Arzner's Trousers"". Jumpcut: A Review of Contemporary Media. No. 37: 88–98. ^ a b c d e f Mayer, So (March 7, 2015). ""Dorothy Arzner: Queen of Hollywood"". British Film Institute. ^ a b c Wise, Damon (October 10, 2016). ""Lumière Festival: Dorothy Arzner, a Hollywood Trailblazer"". Variety. ^ a b c ""Dorothy Arzner"". UCLA Film and Television Archive. ^ a b c d e f g h i j k l m Geller, Theresa (May 2003). ""Arzner, Dorothy"". Senses of Cinema. ^ a b c d e f g h i j k l m n Kay, Karyn and Gerald Peary (July 16, 2011). ""Interview with Dorothy Arzner"". Agnès Films. ^ a b Geller, Theresa (May 2003). ""Arzner, Dorothy"". Senses of Cinema. ^ "Evening star. [volume] (Washington, D.C.) 1854-1972, July 07, 1929, Image 89" (http://chroniclingamerica.loc.gov/lccn/sn83045462/1929-07-07/ed-1/seq-89/). 1929-07-07. p. 15. ISSN 2331-9968. Retrieved 2018-10-23. ^ a b Casella, Donna R. (2009). ""What Women Want: The Complex World fo Dorothy Arzner and Her Cinematic Women"". Framework: The Journal of Cinema and Media. Vol. 50: 235–270 – via https://www.jstor.org/stable/41552560. ^ a b c Field, Allyson Nadia. ""Dorothy Arzner"". Women Film Pioneers Project. ^ Kenly, William S. (1987). ""Paramount: The Early Sound Years"". MoMA. No. 44: 6–7 – via https://www.jstor.org/stable/4381023. ^ a b Shrage, Laurie (1990). ""Feminist Film Aesthetics: A Contextual Approach"". Hypatia. Vol. 5, no. 2: 137–148 – via https://www.jstor.org/stable/3810161. ^ a b c Mayne, Judith (1981). ""The Woman at the Keyhole: Women's Cinema and Feminist Critique"". New German Critique. No. 23: 27–43 – via https://www.jstor.org/stable/487935. ^ a b ""Dorothy Arzner Biography"". Biography. November 13, 2015. ^ Mann, William J. (2001). Behind the Screen: How Gays and Lesbians Shaped Hollywood, 1910-1969. New York:Viking. ISBN 9780670030170. ^ Mayne, Judith (1994). Directed by Dorothy Arzner. (\https://books.google.com/books?id=Y1xSHLHGh7MC). Indiana University Press. p. 42. ISBN 9780253208965. ^ DiMare, Philip C. (2011-01-01). Movies in American History: An Encyclopedia. ABC-CLIO. p. 558. ISBN 9781598842968. ^ Chuba, Kirsten (March 1, 2018). "Francis Coppola Helps Paramount Dedicate Building to Pioneer Director Dorothy Arzner". Variety. Retrieved 4 March 2018. ^ Valenzuela, Beatriz (March 3, 2018). "Dorothy Arzner — pioneering lesbian film director — honored at Paramount". Q Voice News. Retrieved 4 March 2018. This page is based on the Wikipedia article Dorothy Arzner; it is used under the Creative Commons Attribution-ShareAlike 3.0 Unported License (CC-BY-SA). You may redistribute it, verbatim or modified, providing that you comply with the terms of the CC-BY-SA.